Read our blogs from people in the know reflecting on health issues, cancer, our services, fundraising and charity activities important to them. November is mouth cancer awareness month. Read Joanna’s story about mouth cancer here and take her advice to get regular check-ups. “It all started about four years ago when I hurt my shoulder. I was prescribed anti-inflammatories but I took a severe allergic reaction and my tongue swelled up. After that I began to notice a stinging sensation in my tongue. I mentioned it to my dentist who could see white spots. She wasn’t sure what it was and referred me to the Ulster Hospital in Dundonald. Luckily I quickly got an appointment and was red flagged so that I would be seen as a priority. I was in the system for nearly three years while I was monitored and had a number of biopsies done. I was diagnosed with oral epithelial dysplasia, an abnormal development of cells which is a pre-cancerous state. It can affect smokers and people who drink alcohol or a combination of both, though I’ve never smoked and drank very little (I don’t drink any more). I’m just unlucky that my DNA has been kick-started into misbehaving. More recently higher grade epithelial dysplasia was detected. The consultant decided it was time to perform a partial glossectomy, or the removal of part of the tongue. Even after the operation I wasn’t put on anti-inflammatories because of my allergic reaction. The operation was the most stressful thing I have ever gone through in my life. Strangely I was more anxious about the anaesthetic than the worry of cancer. I’ve broken bones before, including my leg but I’ve never been under anaesthetic. I worried about the risks of the anaesthetic and of not waking up. I was so terrified. It was my mum who was worried about the cancer. I had a small piece of my tongue removed. Despite my fears the operation went well and the surgeon was pleased, which makes me feel a lot more confident. My check-ups have been good so far too. The only way it has affected me is that there are parts of my mouth that I can’t reach with my tongue now, but it is a small price to pay. I’m really grateful to my dentist for listening to my concerns and she said I had done the right thing by seeking advice. 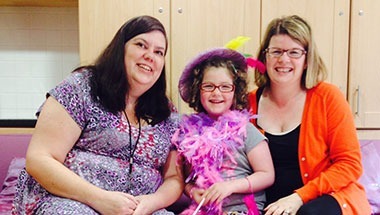 Read this heartfelt letter from a mum whose daughter found comfort in art therapy. Mum Fiona Brown wrote this letter of thanks to our art therapist Joanne Boal while her young daughter was going through treatment for acute lymphoblastic leukaemia. Ellie Louise was only three when she was diagnosed in 2012 but has now finished treatment and is keeping well. 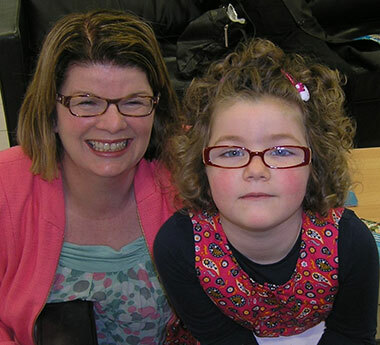 I cannot thank you enough, Joanne, for your art therapy work with Ellie Louise. Since she started, I have to say the support and work you do is so therapeutic for her. While Ellie Louise doesn’t say too much about what she has done, I instinctively know she has benefited from her sessions with your art therapist, Joanne. As a parent I feel somewhat that I have little control of the way in which this journey with leukaemia affects her emotionally and psychologically, both in the short and long terms. I really do believe the art therapy plays a vital role in helping Ellie Louise process her feelings in a creative and positive way. It’s hard to measure the benefits but here are some of my observations: I feel that after a session she’s had fewer temper tantrums, she’s more relaxed and on the journey home from Belfast to Dungannon in the car she usually sleeps for at least 30-40mins. If she has had a session prior to a clinic or treatment she does appear calmer. If she has a session after treatment or on days when she is fasting while waiting to go to theatre, I definitely feel it’s a brilliant distraction. I also feel many worries that Ellie Louise may have and be unable to express find an outlet with art therapy. I only wish I had known about this free Cancer Focus NI service sooner so that Ellie Louise could have benefited from it right from the start, particularly during the most intensive part of her gruelling treatment. 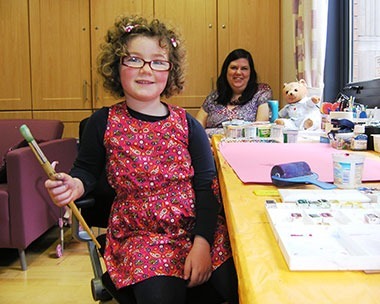 As a nurse myself, I believe in a holistic approach to treatment and feel that art therapy should be integral part of a child’s cancer journey. I see so much merit in having art therapy right at diagnosis stage at ward level and at outpatients. This is extremely highly skilled therapy and could be of benefit to so many children. But it can also be hugely beneficial for adults too and I’d recommend anyone with cancer to try it. It’s time well spent. Ellie Louise feels so safe and comfortable with Joanne. She trusts Joanne. As a parent, I feel confident that my daughter is in very safe hands with a highly skilled professional who goes above and beyond what is expected in her role. So Joanne, I really cannot thank you enough for the time you’ve spent with Ellie Louise. For more information about art therapy please email joanneboal@cancerfocusni.org or call 028 9066 3281. Rachel Smith gives a very personal account of the challenges she faces in her day to day work with children. 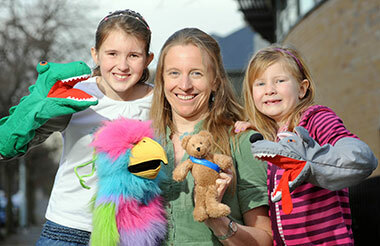 Rachel Smith is the Cancer Focus NI Family Support Co-ordinator, who helps children whose parents have cancer. She gives a very personal account of how she is touched by her day to day work. We all have an idea of how life is going to be, but mine has changed radically in the past seven years. I work for Cancer Focus NI as a Family Support Co-ordinator. My job is to help children whose parents have cancer, helping them understand the illness and supporting them when their parent dies. I also support parents, helping them communicate with their children and, when the prognosis is not looking positive, I help them write books and letters for the family they are leaving behind. I spend months, sometimes years, getting to know a family and then one day while going about my daily life I will receive a text, often early in the morning saying “he slipped away at 4am” or “Rachel, he’s gone”. Over the past seven years I have experienced so many losses in my work. I try to remain emotionally separate, but I am human, a compassionate human, and it hurts every time. Often I check my work phone just before doing the school run. I drive my two young children to school and then cry as I go on to work. It is not the same gut-wrenching loss as that of a personal loved one, but silent tears in the knowledge that a family’s world has shattered. Recently, a gentleman I worked with died. I had known his family for six years, I filmed his eulogy and hours of footage for his family. The magnitude of life and death suddenly hit me. I felt I had reached a limit of sadness and could not take any more. I needed time to think, to feel alive again and to be surrounded by life. When recording books with people a common refrain I hear is “I have no regrets, I just wish I had more time”. So I create time in my own life; I breathe, love, hug and do all those clichéd things so that I can go back into work and be useful again. I refill my cup. I think that when working in such a profession, at times we need to bend the boundaries to be human and to understand that is what people need. It’s ok to be hurt and show hurt, to put your hands up and say I need a break, I need to go and breathe for a while. You are meant to be here. I believe that although I wanted to be here and share your life, the ups and the downs, God needs me elsewhere and you have to stay on Earth. Be a good friend and surround yourself with good friends. You don’t need to be the most popular one, the strongest or cleverest. But always be a good friend to those around you. 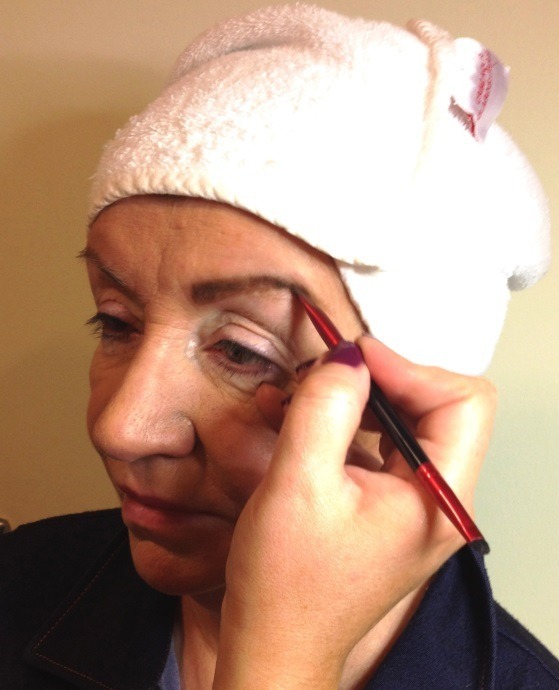 Fiona Barr, the Cancer Focus NI beauty therapist, tells you how to get those perfect eyebrows if you lose your hair during chemo. Looking your best can be tough when you have cancer. One of the best known side-effects of chemo is partial or complete loss of hair, often losing your eyebrows as a result. 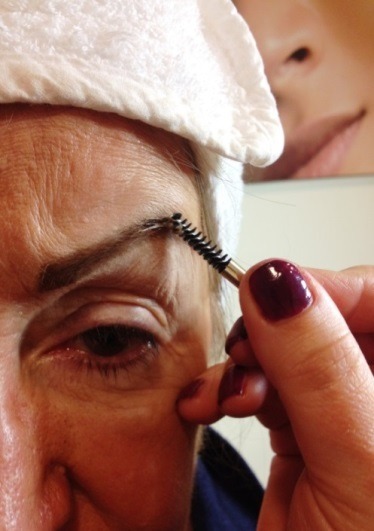 So, how do you get your eyebrows looking their best? Are you trying to find the best way to achieve a natural looking brow with more shape and the perfect arch? Well, here’s a step-by-step guide for that perfect brow! 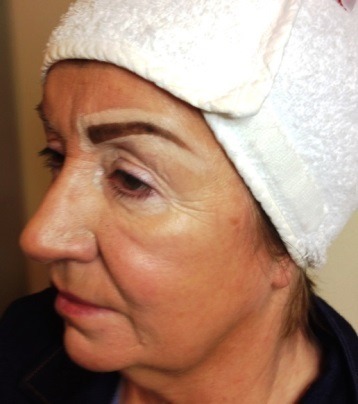 Eyebrows frame the face and bring your face to life. If you’ve lost yours you can still achieve the look using makeup. 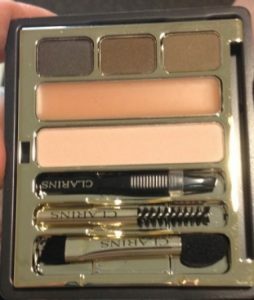 I used the Clarins Pro Palette Eyebrow Kit but you can use any make as long as it’s your right colour match – the correct shade is one that matches your hair colour. This kit includes 3 shades to make-up, shape and even eyebrows, a wax to fix them and a beige eye shadow to enhance beautiful eyes. A double applicator, eyebrow brush and mini-tweezers complete the kit. Not everyone can have arches on their eyebrows, as they might not be flattering. For instance, people with long faces should avoid high arches and keep their eyebrow shape flat. Low Forehead – People who have low foreheads should ensure they always keep their arch much lower. Raising your eyebrow arch higher will make you look surprised always, something you do not want. 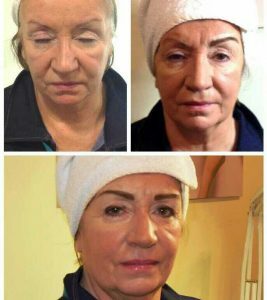 It will also work well for people who have longer faces as well wider ones. Higher Arch – If you have a round face, you need to create a higher and sharper arch. This will help make your face narrower and make your forehead to look much longer. Wide Set Eyes – whenever you are arching your brows and you have a wide set eyes, you need to ensure you move the arch starting points inwards and not on the conventional place. This will make your eyes to look much closer to each other. Start by marking where your eyebrow will begin, and mark where they will end before you mark where your arch will be. Using an eyebrow pencil, mark each point to keep you right when you fill in your brow. Once you have worked these three points, draw your eyebrows with the correct shade of pencil or eyebrow kit, with powder and a fine brush applicator. 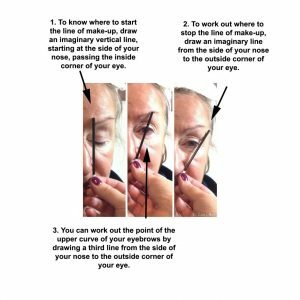 Draw little traces of eye pencil in the areas which have lost hair Always work from the side of your nose to the outside end of the eyebrow. Work to get a shaded tone effect by leaning more heavily at the start and progressing to a light touch towards the end of the brow. Apply the little touches one after another, but not in a very straight line. That way it will look more like your own brow. After the lines are drawn, gently smudge them to create a natural look. I also used the wax in the Clarins eyebrow kit to keep any unruly hairs in place. Use concealer (I used Clarins Instant Concealer) around the brow to highlight, define shape and correct mistakes, using a concealer brush. 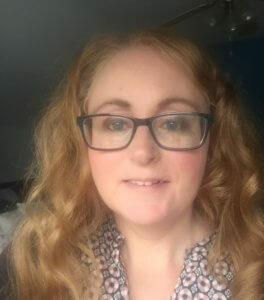 ‘I provide one of Cancer Focus NI’s services called Beauty for Life, which helps men and women who’ve been affected by cancer, both patients and carers, to feel a little bit better about themselves. 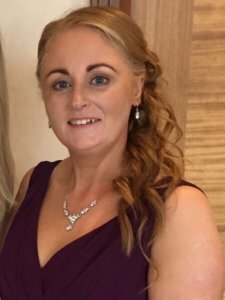 I’ve been in the beauty industry for ten years and owned my own salon in Belfast for seven years. After my mother became ill, I gave up my job as a beauty therapist and became her main carer. When I painted her nails or put tan on her face it made the difference between her staying in bed all day and getting up. After she passed away, the idea of working for a charity really struck a chord; that’s when I joined the Cancer Focus NI team. 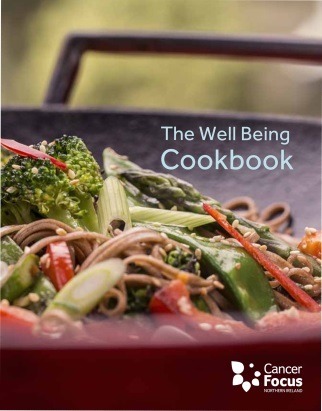 Trained cook Jeanne Rankin explains why the Cancer Focus NI Well Being Cookbook is a great buy. 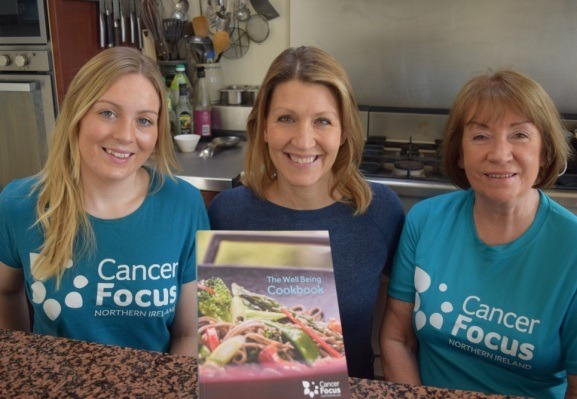 Jeanne Rankin (centre) wrote our Well Being Cookbook for cancer patients along with Cancer Focus NI staff members Niamh McDaid and Deirdre Conlon. Jeanne, a yoga specialist, explains why it’s a great buy. As a trained chef, I know the value of good food prepared simply. Hopefully this cookbook created with Cancer Focus NI has some simple recipes that won’t seem like to much of an effort to make, especially when your energy is low as I know this can be a struggle. Something that will truly help is eating good food with your family and friends – it helps unique inner healing within the body. Cancer treatment affects everyone’s body differently, from feeling sick to no sense of smell or even taste. I feel creating this cookbook has allowed me to give patients options of what they could eat to make them feel stronger throughout their treatment or afterwards when you are still struggling. Here’s a taster of one of the calorie rich meals – chicken with tagliatelle, mushrooms and cream – that will give you that pick-me-up, and is quick and easy to make. Cut the chicken breasts into bite-sized pieces. Season lightly with salt and pepper. Heat two tbsp of olive oil in a large frying pan and sauté the chicken pieces until cooked through. Sauté the onion and mushrooms in the remaining oil in another frying pan over medium heat for approx 3-5 minutes. Add the cream, chicken stock, salt and pepper and simmer gently until it has reached a sauce consistency. Place the chicken pieces in just at the end to warm through. Place the hot pasta on a plate and ladle the chicken sauce liberally over. 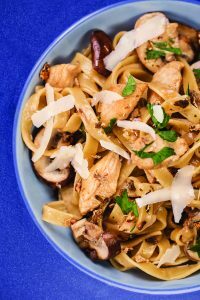 Optional: a little dried, crushed porcini or other dried mushroom added to the sauce as it is simmers will greatly enhance the flavour. I’m also a yoga specialist and believe it’s important to keep a calm mind, create an inner peacefulness and de-stress the body. There are various ways to do this, and we also have a section in the cookbook that deals with such topics as yogs, breathing and meditation. Yoga has so much more to offer your body if you’re living with cancer. It helps to bring balance and connection to the body, mind, emotions and spirit. Yoga helps the body deal with life-changing illnesses. I hope this book can bring togetherness that can be felt when good food is shared and enjoyed with your family and friends to offer unique inner healing. 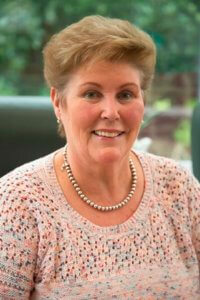 When nurse Mary Graham retired from her NHS job she wanted to continue using her experience and skills. Here, she explains what she does in her role on the Nurseline for Cancer Focus NI. You can call our free Cancer Focus NI Nurseline on 0800 783 3339. So what do we do on the Nurseline? Our primary responsibility is to support those who contact us, whatever the reason. Many of our callers are people with cancer or members of their family. Often they just want to talk and share feelings with someone who feels safe. Sometimes people are seeking practical help. This might be advice about finances, help with transport to hospital appointments or guidance about how to tell a child what is going on. Occasionally, someone might use us to ‘sound off’ and offload their anger, fear and pain. Whatever the call, our role remains the same – to respond with compassion and without judgement and to offer support and advice relevant to each individual. In fact, it was a series of calls to our helpline that prompted Cancer Focus NI to launch its ongoing campaign calling for Equal Access to the same drugs for patients in Northern Ireland that are available in England. Having listened to the caller, maybe for a few minutes but often for much longer, what can we offer? Our job is to provide a listening ear, and sometimes this is all that is needed. But often it is appropriate for us to suggest another source of help. Perhaps this might be a referral to our counsellors or Family Support team if patients or families want ongoing help during a very difficult and uncertain time. Or we may advise a chat with their specialist nurse or consultant. Those looking for financial guidance can be signposted to the Citizens’ Advice Bureau (based in our major hospitals). 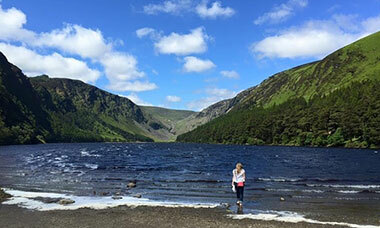 At certain times of the year we get many folk looking for travel insurance, which can be costly for those with a pre-existing condition – we can signpost these callers to sources which may be sympathetic to their needs. And then there are those who have completed their treatment and are now feeling a bit lost and disconnected after many months or years of hospital care and treatment. Here we could discuss support groups or our Zest for Life programme, bra-fitting for women who’ve had breast surgery or art therapy services, for example. The Nurseline is covered by a nurse from Monday to Friday between 9am and 1pm. The nature and number of calls is varied and unpredictable. Some days we may only get a couple of calls, some days there may be five or six. Then there are days when our phone is more of a hotline than a Nurseline, with calls coming in constantly. 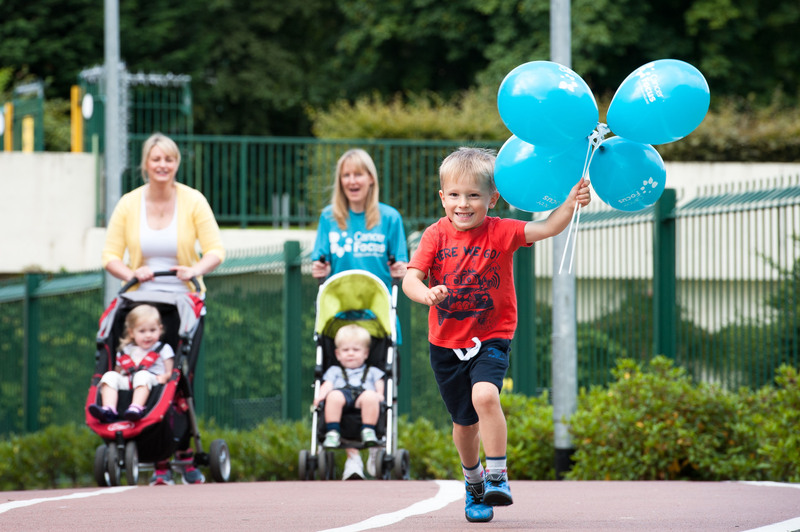 Even when we’re not there you can leave a message or email us at nurseline@cancerfocusni.org. If you have any concerns about cancer, please call us on our Nurseline, which is free, on 0800 783 3339. 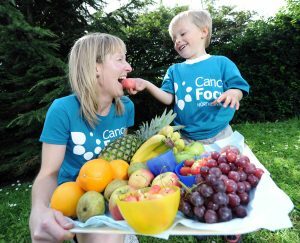 Health professional Clare Smith reveals the tactics she uses to encourage her three young sons to eat more healthily. 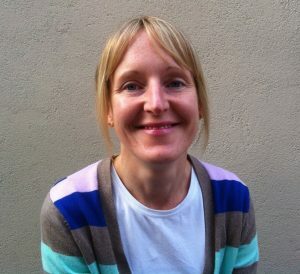 Mum of three strapping lads, Clare Smith works in cancer prevention and counselling and has a few thoughts to share on children, food and exercise. I’m still not sure why I decided to write this blog, especially considering it has just taken me the guts of an hour to convince my youngest to eat his dinner otherwise his dessert would go in the bin (yes, bribery does work!) But here I am anyway, laughing as I type because it wasn’t too long ago that I hated reading articles like this written by ‘know it all yummy mummies’ and now I’m the one writing one! Please believe me… I don’t have all the answers and I genuinely do not fit into the ‘yummy mummy’ category but I do have three young children and a bucket full of ideas (some have worked/others haven’t). But if all else fails, at least you will know to avoid some of my disasters! This is my 5 point guide. I learned very quickly that I could not sit and eat a Danish pastry while expecting my 5 year old to make do with a few bread sticks. As parents we should be role models for our children, they will want what we are eating. And this type of ‘modelled behaviour’ also works with exercise – my 9 year old wants to “play rugby just like Dad” while my 6 year old wants to do the local park run with me! We have all heard this before – if it’s not in the house, we won’t be tempted to eat it… and it’s true. Children cannot winge and complain to have something that isn’t there. So don’t buy the crisps, biscuits and sweets when you are doing the shopping. Save those treats for ‘Saturday sweets’ or whatever day you choose to let the children (and yourself) have a treat. So think about it. You are at the cinema armed with your large bucket of popcorn and the film starts. You start eating. How many of us have stuck our hand into the bottom of the popcorn bucket and been surprised that there isn’t any left? Exactly… if we don’t completely focus on what we are eating then we are likely to eat a lot more. Some people take this one step further and say “let them help prepare meals”. Now, I don’t know what it’s like at meal times in your house but it is mayhem in my house. The last thing I want is one of the children attempting to chop a pepper! By letting them choose a meal each week, you still involve them in meal times but it’s just less messy and time consuming! At this moment in my family’s life there is very often confrontation at meal times, there is inevitably fighting over allocated screen time, a reluctance to walk the dog and honestly I feel that I wash what seems like the entire Six Nations rugby kit. But I passionately believe that as parents we have a responsibility to at least try and encourage our children to eat healthily and take more exercise. It frightens me when I look around and see more and more overweight/obese children struggling to do what other normal weight children are enjoying doing. I want my children to grow into healthy young adults with sensible eating habits who are able to enjoy life to the full. I want them to be aware of the links between being healthy and having a lower chance of getting cancer, heart disease, strokes and so on. So, if achieving all this for our children’s future means taking the fuse out of the Xbox plug every now and again then bring it on!